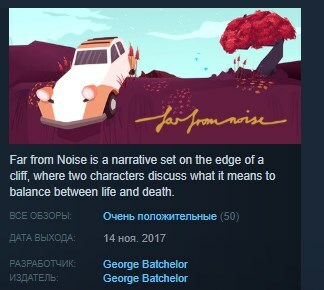 Far from Noise STEAM KEY REGION FREE GLOBAL. You are balanced on the edge of a cliff in an old rusting car. The sun is setting behind the horizon and night will soon fall. With no immediate means of escape, perhaps all that´s left is to attempt to feel some connection with the world at the end of it all. Far from Noise is a single-player narrative told through dialogue choices. As day fades to night, experience quiet moments of interaction with a variety of creatures and witness the transformative forces of nature as they happen around you. Through conversation with a welcome companion, begin to discover your reasons for being out there, your relationship with the world, life and death, and if you´ll see tomorrow. Лайки Instagram [скидка 30%] + БОНУС 15% 47.3601 руб.